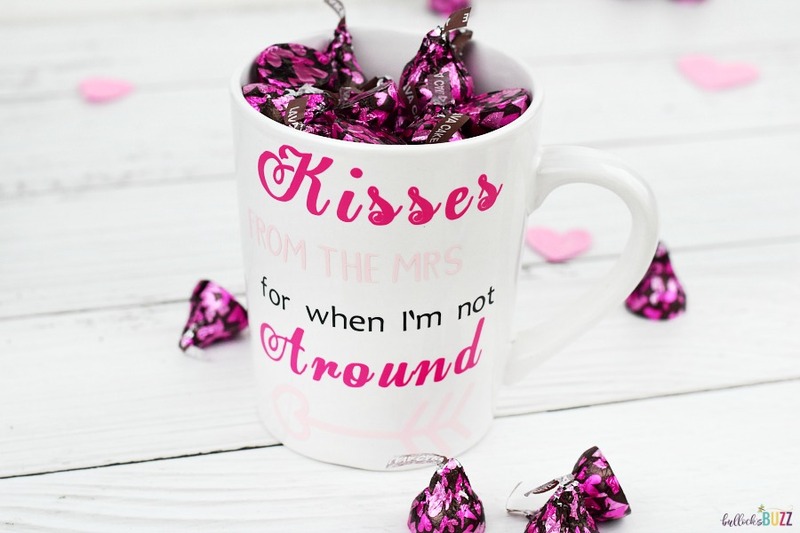 This adorable Kisses from the Mrs. DIY Valentine’s Day Coffee Mug is two special treats in one. It’s a sweet DIY Valentine’s Day gift that is sure to steal his heart! Valentine’s Day will be here before you know it! And now’s the perfect time to get crafting. 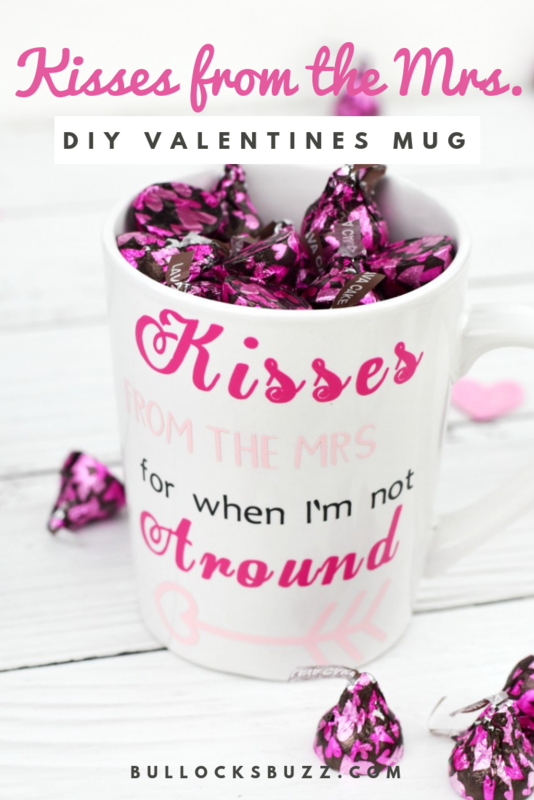 This Kisses from the Mrs. DIY Valentine’s Day Coffee Mug is inexpensive, easy, heartfelt…and filled with chocolate! And we all know that no Valentine’s Day is complete without chocolate. It’s the perfect handmade Valentine’s Day gift! 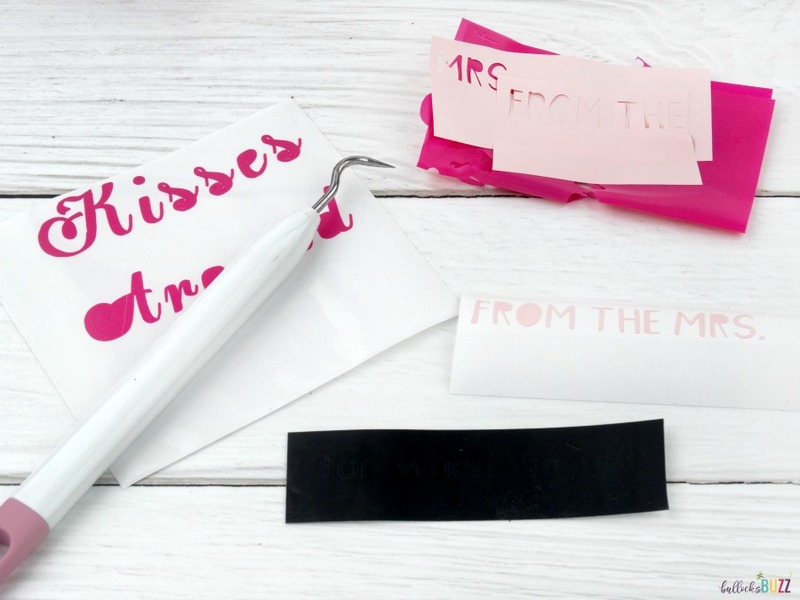 This adorable DIY Valentine’s Day present is actually two greats gifts in one! Filled with delectable NEW HERSHEY® Lava Cake KISSES chocolates , he’ll think of you each and every time he snags a HERSHEY® KISSES chocolate. And then, once he finishes the sweets in this candy-filled mug, he can use it again and again for his favorite drink. This DIY Valentine’s Day coffee mug is not only cute, it’s also very easy to make. While I used my Cricut Explore Air, if you don’t have one, don’t worry! You can easily use waterproof craft paint or even Sharpie markers instead. 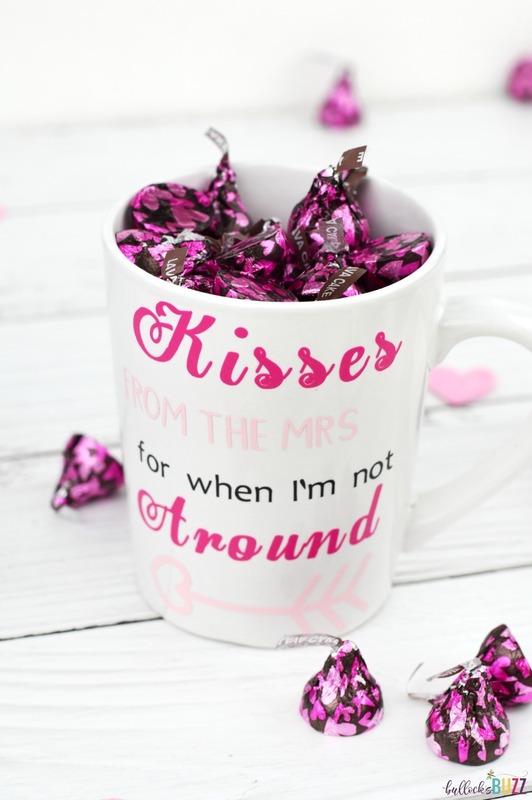 Here’s how to make this fun Kisses from the Mrs. Valentine’s Day coffee mug. Begin by cleaning the mug with rubbing alcohol. This will help remove any dirt or grease so the vinyl will stick better. 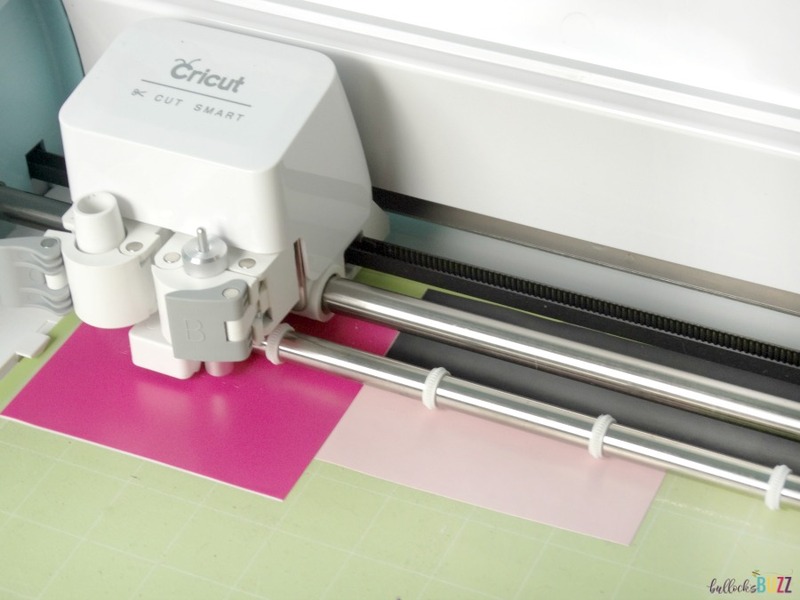 Next, open a new project in Cricut Design Space. Begin adding the text in whichever font you’d like. 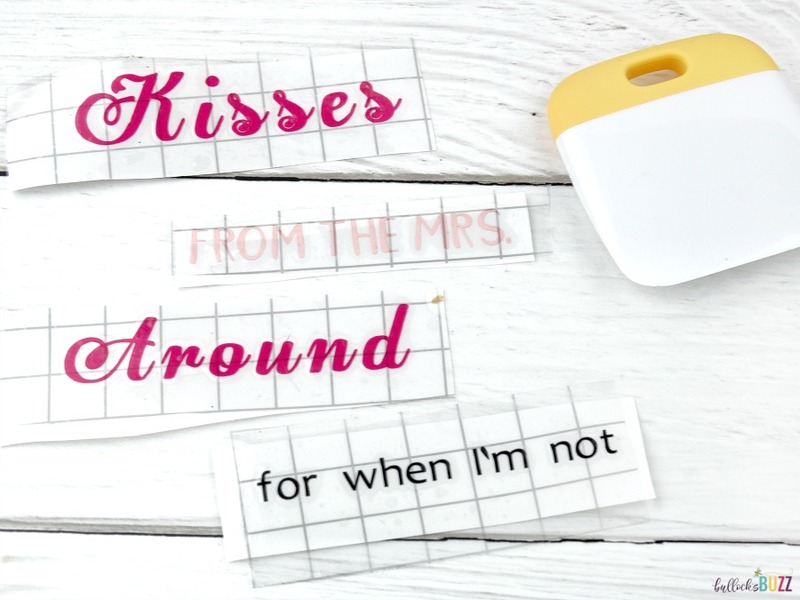 I used Egregio Script in bold for the words ‘Kisses’ and ‘AROUND’, Ciscopic bold for the words ‘from the Mrs.‘, and Candara for the words ‘when I’m not‘. the words ‘Kisses‘ and ‘AROUND‘ measure 3.175″ wide and 1.938″ tall. ‘when I’m not‘ measures 3.129″ wide and 0.3″ tall. ‘from the Mrs.’ measures 2.961″ wide and 0.401″ tall. Now, add the Valentines arrow image, making sure to adjust the size as needed. For my mug, the arrow measures 2.804″ wide and 1.0 tall. After everything has been cut, carefully remove the vinyl from the mat, then use the weeding tool to remove any remaining vinyl you don’t need. Next, use transfer tape to transfer the words and image to the mug. Repeat for the Valentine’s arrow. Don’t forget to go over the design a few times using a Cricut spatula or a credit card edge to ensure the vinyl sticks to the mug. 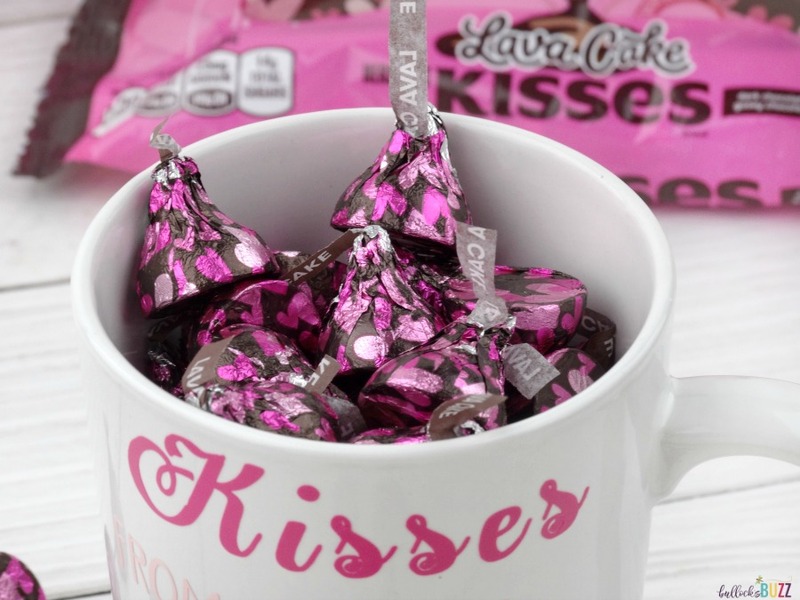 Now all that’s left is to fill the mug with HERSHEY® Lava Cake KISSES chocolates. And that’s it. Your DIY Valentine’s Day gift is done! 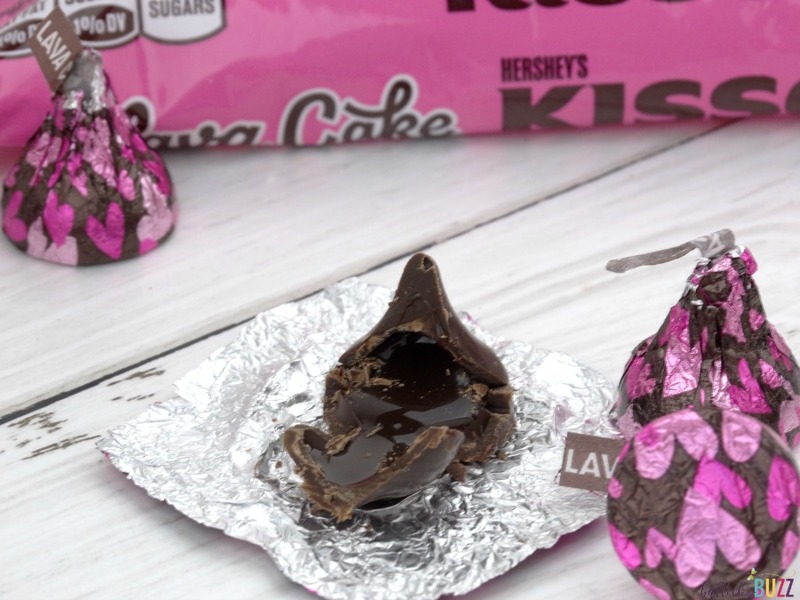 These HERSHEY® Lava Cake KISSES chocolates are the perfect candy to pair with this DIY Valentine’s Day gift! Made with real HERSHEY® rich, creamy chocolate, these lava cake flavored candies have a semi-sweet dark chocolate outside and a dark chocolate, gooey center that tastes just like a real lava cake. 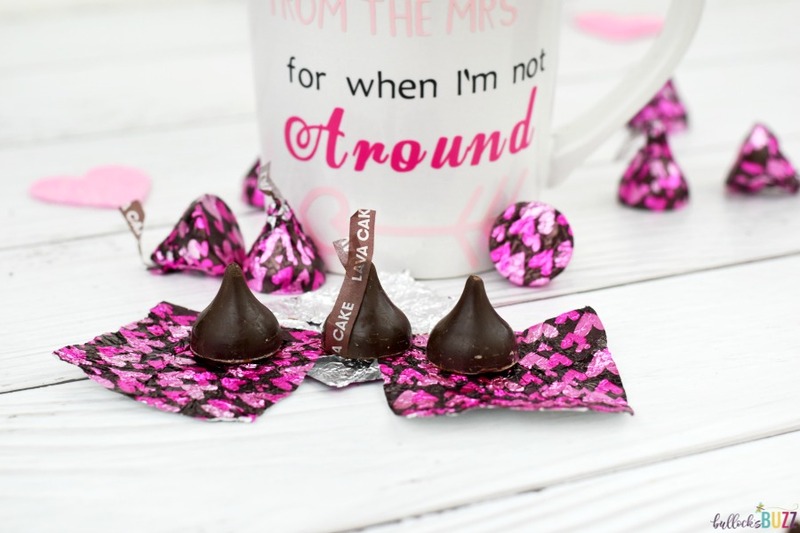 And I love the dark brown foils covered with bright pink hearts – they fit the Valentine’s Day theme perfectly. 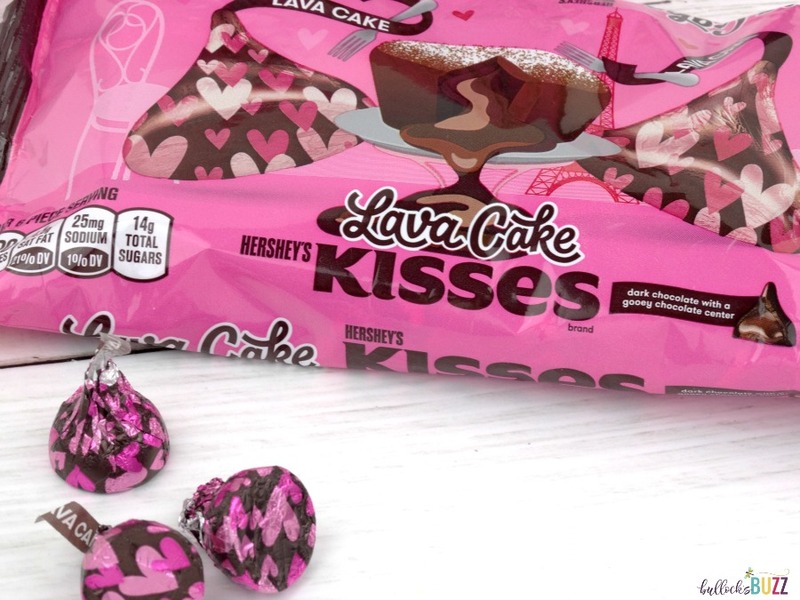 These NEW HERSHEY® Lava Cake KISSES chocolates are truly a delicious twist on the classic candy favorite; one that helps make the day that much brighter! 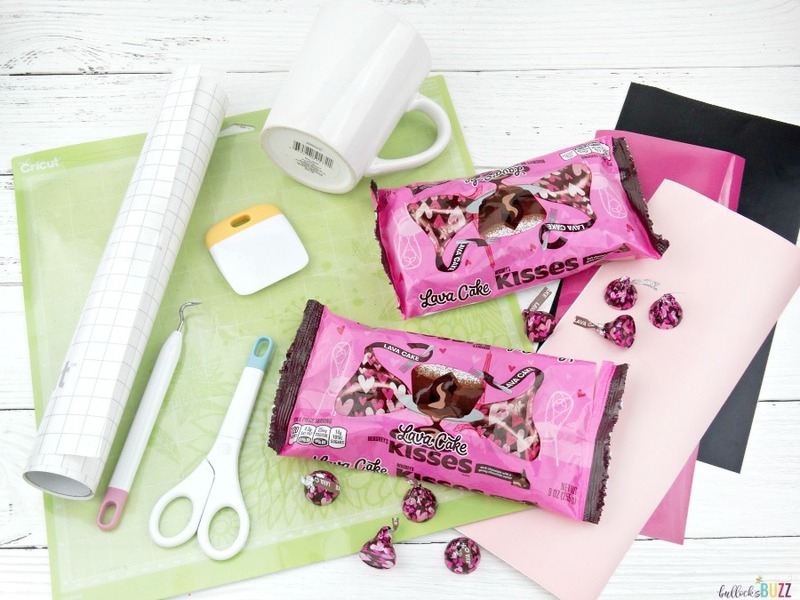 You can find the HERSHEY® Lava Cake KISSES chocolates in the seasonal aisle at Walmart, along with everything else you need to make this extra sweet homemade Valentine’s Day gift. Walmart is a great one-stop shop for all-things Valentine’s Day!